What's With the Long-Empty Building at Rt. 7 and Ferry Road? 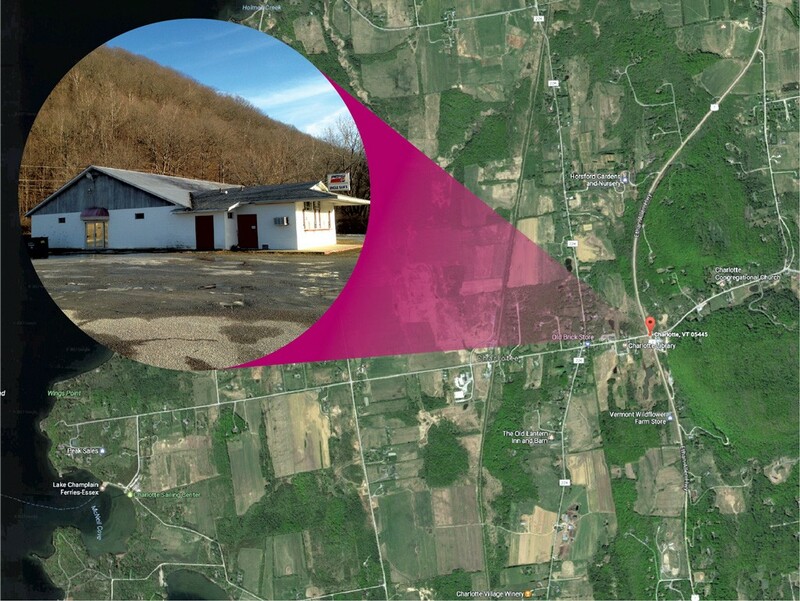 Prime commercial real estate in Chittenden County isn't easy to come by, especially in high-visibility locations that don't have much competition nearby. That's why one Charlotte reader was scratching his head recently as to why the commercial property at the corner of Route 7 and Ferry Road in his town has sat vacant and largely unused for years. WTF? As longtime locals will tell you, it hasn't always been that way. John Oren, 69, who grew up across the road from the Old Brick Store in Charlotte's west village, remembers how, in the 1970s, a gas station and bingo parlor occupied that corner. In those days, he says, Route 7 still ran down Church Hill Road, a treacherous route for school buses on snowy winter mornings. In more recent years, the 1.2-acre parcel at the intersection's southeastern corner has been home to Spear's Garage, then later to Steve's Citgo and Uncle Sam's Dairy Bar, the latter of which was better known to locals simply as "the creemee stand." Recalls town selectboard member Matt Krasnow, himself a lifelong Charlotte resident, "I used to love getting creemees there after Little League games ... It was a rite of passage that [Champlain Valley Union High School] kids would work there in the summer, or at the Charlotte Beach. It was a great small-town business." But times change, and small-town businesses come and go. The gas station closed for good a couple of years ago, at about the same time Bill Spear and his wife, Helena, decided they'd had enough of slinging soft serve. Says the 84-year-old Spear, who owns the entire corner, including the white garage his brother built and the now-vacant snack bar, "My wife got tired ... and I'm too damn old to run it now." So why hasn't anyone snapped up that prime corner, which Spear says he'd happily off-load? At first glance, the spot seems like an ideal location for another gas station, garage, convenience store or — for the locavore-minded — an outlet selling Vermont-made products such as maple syrup, wine and hard cider to tourists. The location doesn't lack for traffic. Plenty of travelers getting on and off the Lake Champlain ferry, which runs between Charlotte and Essex, N.Y., drive by there every day. According to data from the Vermont Agency of Transportation, the average daily traffic through that intersection is 11,200 vehicles. Ferry Road alone sees 3,100 cars and trucks a day; Church Hill Road, the eastern extension of Ferry Road, 1,900 vehicles. One likely hindrance is the site's zoning. Not much can be built there without changing the land-use rules, something old-timers say is no easy task. Charlotters are inclined to preserve their viewsheds and not obscure the night sky with lots of illuminated signage and street lights. As Spear puts it, the town can be a bit "fussy" about such things. Back in the mid-2000s, a petition circulated to allow more commercial activity on that corner, as the current zoning permits just 30 square feet of retail space — about enough room to sell gum, cigarettes, condoms and antifreeze, but not much else. The selectboard deep-sixed that petition. A more recent, community-minded proposal didn't fare any better. In June 2016, VTRANS released the findings of a feasibility study for building a park-and-ride facility in Charlotte. Of the seven sites proposed within town limits, the Citgo/creemee stand corner ranked the highest on the state's matrix. Criteria included accessibility, cost, environmental impact and visibility from Route 7. According to that study, the corner could hold 77 parking spaces, with room for the eventual addition of another 43. Despite the state's offer of ample funding, the selectboard gave that proposal a chilly reception, voicing concerns about the potential for crime, light pollution and other misuses of the lot. So will the corner remain forever vacant, destined to host nothing bigger than a sporadic garage sale or flea market? Not necessarily, says Krasnow. He says the board is currently mulling over a proposal to include the east side of Route 7 in the west village's commercial district. Additionally, plans are in the works to expand the village's municipal septic capacity, which could encompass that parcel and make it more attractive to potential buyers. Then there's the safety consideration. Any new commercial use of that lot could require additional upgrades to the intersection itself, which VTRANS has designated as a "high-crash location." Between 2008 and 2012, 24 crashes occurred at or near the intersection; eight resulted in injuries. If nothing else, a new buyer might have to pony up for a new pedestrian crosswalk. Still, Krasnow remains optimistic that the right buyer will come along eventually. "Living there my whole life, my dream is that they reopen that creemee stand and get another garage there," he says. "Both are two very missed businesses in this town."